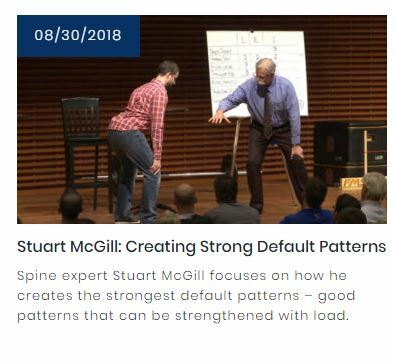 Last week on OTPbooks.com — Spine expert Stuart McGill focuses on how he creates the strongest default patterns – good patterns that can be strengthened with load. If you mix that in with daily trains, planes and automobiles, you can see why I (we, Tiffini is with me) need a day off. It’s Ireland. And Norway. And Northern Ireland! Our bride had three dresses prepared. As she continued to exercise and diet, she kept changing sizes. This brought forth the term: “Wed Shed, Patent Pending.” I loved the phrase. Niall’s “man” brought kettlebells to the reception and…well, you should have been there. It’s a quiet time of year on the fitness front. That’s why I found this article so excellent. Now, you can take issue with any or all of it, but it is well worth thinking about. I follow Janda’s insights on flexibility, basically just keeping the biceps, pecs, hammies and hip flexors pliable and then keeping, at best, the full range of the joints. More is not always better. From what I have experienced, we are now seeing a rise in “Mobility Gone Wild,” with joints that are inflamed and permanently damaged due to excessive joint manipulation and aggressive self-treatment. It’s not that joint mobility is a massive risk or not worth doing—it’s just that the wrong information placed at the wrong time is not terribly effective. Hip labrums, upper spines, elbows, and ankles are all areas that therapists are seeing more and more complaints about from athletes doing too much self-care. Most of the issue is that athletes equate pain with a lack of mobility, when the reality is that sometimes most of the referred pain is just overuse syndrome and inflammation creating discomfort, and overreacting makes the problem worse. When athletes let fear and emotion drive their self-diagnosis, contraindicated movements that actually cause real damage to joint surfaces become the bane and not the antidote. I’m never sure if I should post my materials or not, but this article (thank you Brian!) was the genesis of a book that was never written. It’s the philosophical foundation of a career…any career. Coach Maughan, who was drafted by the Detroit Lions, made an Olympic team as a hammer thrower, won the nationals in the javelin and earned three medals at the Battle of the Bulge, maybe had more reasons to be reasonable, frankly. Coach Maughan, part of the Greatest Generation, had seen and done things that were glorious and tragic and understood life well. “His way” was usually a pretty good idea. And, to me, reasonableness is another word for integrity: integrity to truth, to the evidence, no matter where it leads…Are you ready to discover “through experiment and reflection what course of life will fulfill those powers most completely?” That’s being true to yourself; that’s integrity; that’s reasonableness. “To the evidence, no matter where it leads” is the drumbeat of my search for better ways to seek and attain our goals in fitness, health and sports. This point is the cornerstone of my talks as we see the question: “Well, where do we get this evidence?” For me, I have been lucky to have great mentors throughout my career, starting with my brothers. I also was smart enough to trust to follow simply what the “best” were doing and then do it. My mother claimed I was raised by wolves. I’m not sure about it, but, after reading this article, there is much wisdom to be gained by our canine friends. One day, college football in America will wake up and realize how amazing football can be outside of the conferences they love to promote. If you ever get me going, ask me about the great winning records of many of the programs in the 1960s. This article begins to right a wrong. However, the NCAA dropped a bit of an unexpected bombshell on the state of Utah when they published the 2018 edition of the records book. Because this is the first year that the NCAA retroactively recognized the 2008 Utah football team with a “national poll championship.” That national poll championship comes regards of the Jeff Anderson/Chris Hester computer rankings, which following the conclusion of the season, determined Utah was the 2008 national champion. So what in the heck are the Jeff Anderson/Chris Hester computer rankings? They were one of the computer rankings polls that was used to determine the BCS rankings until the NCAA jettisoned the approach prior to the establishment of the college football playoff in 2014. Although the rankings are no longer used to determine the national champion, they are still published weekly online. According to their Web site, the rankings are compiled using four core underlying philosophies: the rankings don’t reward running up the score, they do not prejudge teams, they claim to compute the most accurate strength of schedule rankings, and claim to compute the most accurate conference strength rankings. Until next time, keep lifting and learning. Merlyn had finished his breakfast, and was puffing at the meerschaum pipe which made his pupil believe that he breathed fire. Now he took a deep puff, looked at the Wart, opened his mouth to speak, changed his mind, blew out the smoke and drew another lungful. He sat down resignedly upon the most comfortable part of the floor, perceiving that he was in for something like the parable of the looking-glass. “They walked all the next day, and came that evening to the house of a very wealthy merchant, whose hospitality they craved. The merchant was cold and proud and rich, and all that he would do for the prophet and his companion was to lodge them in a cowshed and feed them on bread and water. In the morning, however, Elijah thanked him very much for what he had done, and sent for a mason to repair one of his walls, which happened to be falling down, as a return for his kindness. “The Rabbi Jachanan, unable to keep silence any longer, begged the holy man to explain the meaning of his dealings with human beings. Tobacco might be something that Wart would have never seen before in his life. Bob Newhart has a wonderful skit on Sir Walter Raleigh “selling” smoking to the English. Hence, Merlyn becomes “fire breather.” I struggled with this story the first few times I read it and I have to admit I had more of a “Wart-like” reaction. Well, yes…yes, of course. Ha ha! By the way, the actress who says this in the movie has an odd legacy: Joanna Barnes was in BOTH The Parent Trap movies (1961 and 1998). I suddenly realized I may have told you some things that were not necessarily interesting or fascinating…but it seems to be over! It seems to be an affront those who believe in pre-destination and those who don’t believe in pre-destination, but I like the idea that we can “tip the scales” in our favor. In ancient Egypt, the dead were buried with small weights so they could tip the scales, one’s heart has to be light, in the Hall of Ma’at. Anubis reigned over this and the deceased had to review 42 separate transgressions and be innocent of these crimes. Sneaking a few weights on the scales gave you chance for a happy afterlife. Sometimes, as White is teaching us, life is unfair. Maybe the Egyptians were onto something, but that is a discussion for another time.